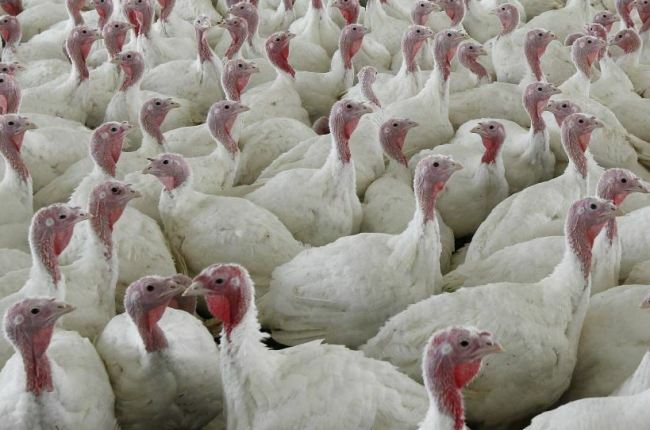 NEW YORK (AP) -- There’s no reason to skip Thanksgiving dinner because of a salmonella outbreak linked to raw turkey. That’s according to health officials who’ve been monitoring the year-old outbreak. But they say it’s a reminder to properly prepare your holiday bird. Cooking kills salmonella. Salmonella is considered widespread in poultry, and it’s perfectly legal for supermarkets to sell raw turkey that has the bacteria. Part of the rationale for allowing salmonella is that people don’t eat chicken medium rare, said Timothy Lytton, a Georgia State University law professor. In 1974, a court said that “American housewives and cooks normally are not ignorant and stupid” and that they know how to prepare food so people don’t get sick. The rules differ for other products. For instance, salmonella is not allowed in packaged foods that aren’t cooked to kill germs. Since it began last year, the outbreak linked to raw turkey has caused one death and 164 reported illnesses in 35 states. Until last week, regulators hadn’t been able to tie any cases to a specific product or supplier. That’s even though investigators said 29 unidentified slaughtering and processing plants tested positive for the salmonella strain involved. The recall could be confusing because federal regulations are contradictory. The US Department of Agriculture doesn’t prohibit salmonella but can ask companies to recall products once they are clearly shown to be responsible for illnesses. The USDA’s Carmen Rottenberg said the agency can’t take action until it has enough evidence. Salmonella spreads through animal feces. It is blamed for an estimated 1 million cases of food poisoning a year, with symptoms including diarrhea, vomiting and stomach cramps. Whether someone gets sick depends on the strength of the strain, the amount and the person’s susceptibility, the USDA notes. But the agency says cooking should kill salmonella. The USDA tied one illness in Arizona to Jennie-O ground turkey meat. The recall by Jennie-O was limited to turkey from a single day’s production in September from a manufacturing line in Wisconsin. The packages had use-by dates of early October but could still be in freezers. The ongoing outbreak doesn’t necessarily mean there’s more food poisoning from salmonella. Improved detection might just be discovering outbreaks that in the past might have seemed like unrelated cases, said Sarah Sorscher of the Center for Science in the Public Interest. “It’s shedding a light on a longstanding problem,” she said. — It seems counterintuitive, but don’t rinse raw turkey — that can spread any germs. Hormel’s Richard Carlson stressed salmonella in turkey is not unusual and that proper handling and cooking should get rid of it — even in the Jennie-O ground turkey recalled last week. Regulators, though, say to throw it out.